Ambrosia and Iron: Can't stand the rain? 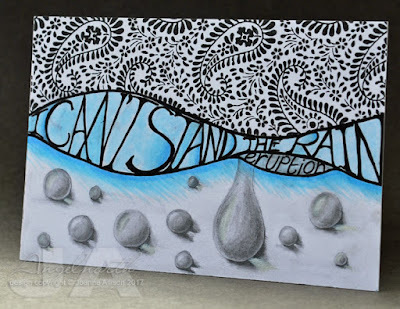 The song title for this month's challenge at the Craft Barn is very apt for April - I Can't Stand the Rain! I'm definitely going to show my age with this one - the disco version by Eruption is the first and only thing to pop into my head on mention of this title (although I confess I did have to look up the name of the group to make absolutely sure I had it right!). Lots of hand drawing on this postcard - I started by drawing the curved lines and lettering the song title and group name, adding just a bit of Copic colour in shades of blue/aqua. Then I had a go at drawing rain drops (this tutorial on YouTube is very useful) and although I need a fair bit more practice, I don't think they're too bad for a first attempt. I masked the bottom of the postcard and stamped the paisley pattern to fill in above the top curve. This is not my usual style and I had fun experimenting - play time! A fabulous postcard. The raindrops are amazing.